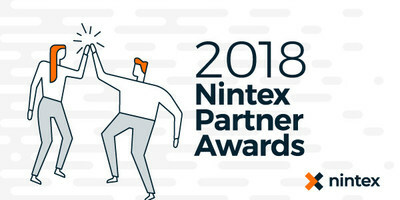 LAS VEGAS, July 15, 2018 /PRNewswire/ -- Nintex, the world's leader in intelligent process automation (IPA), is pleased to recognize exemplary channel partners in the United States, Europe and Asia who are all leaders in their respective fields with 2018 Nintex Partner Awards. "We couldn't be more proud of what our 2018 Nintex Partner Award winners have accomplished this past year," says Nintex CEO Eric Johnson. "Nintex partners are critical to our success and are helping customers across the public and private sectors realize the promise of digital transformation by showing them how easy and powerful it is to automate, orchestrate and optimize business processes with the Nintex Platform." This evening senior leaders from Nintex celebrated with the company's top partner organizations where each were recognized for their individual business achievements at an awards dinner in Las Vegas. Tonight's event coincides with the start of the annual Microsoft Inspire conference where Nintex is a titanium sponsor. Data One GmbH was also recognized at the Nintex Partner Awards dinner for 10 years of partnership with Nintex. To learn more about Nintex's partner program, visit https://www.nintex.com/partners or stop by the company's booth (#401) at Microsoft Inspire. Nintex is the world's leader in intelligent process automation (IPA) with more than 7,500 enterprise clients and 1,700 partners in 90 countries who have built and published millions of workflow applications. With its unmatched breadth of capability and platform support delivered by unique architectural capabilities, Nintex empowers the line of business and IT departments to quickly automate, orchestrate and optimize hundreds of manual processes to progress on the journey to digital transformation. Nintex Workflow Cloud®, the company's cloud platform, connects with all content repositories, systems of record, and people to consistently fuel successful business outcomes. Visit www.nintex.com to learn more.